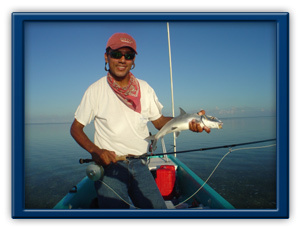 Cancun Flats Fishing - Fly fishing and light tackle in Cancun and Isla Blanca. Bring sunscree, polarized sunglasses, insect repellent, rain gear, long and short sleeve shirt, and of course a camera. Do I need Wading Gear? Not at all! 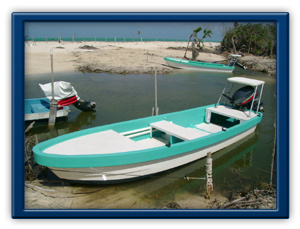 We off the boat which has a large casting platform and goes through very shallow waters. Of course! Bring whatever you would like and what ever else you need, we'll have it here for you. Fly or spinning, lures or flies, we've got everything you need at no extra cost. No! We do catch and release only. Is it going to be rough on the water? We always have sheltered ares to fish so the wind is not a serious issue. Only during the strong north winds we may have to postpone the trip for another day.